← Joyously Free From the Burden, Oppression and Depression of Lordship “Salvation” and Calvinism. For our Savior, The Lord Jesus Christ and His Free Gift of Salvation — by His Grace alone through our Faith alone in Jesus alone. What an amazing Gift from God!!! This thanks extends to each of you, our readers and commenters — from the day we first “met” you — and it will last throughout all eternity. For discernment for all of us in a time when churches and organized “religion” are drifting further and further from the Truth of God’s Word and His Grace into a system of false justification by human works. This ministry would not exist without each of you our friends who visit here, read, comment and discuss God’s Word. Without you, this ministry would be only a shadow of what it is today. The Lord has used each of you to reach far beyond anything we could have imagined or expected in our prayers. We are reaching the world (into almost every continent) for Jesus Christ and His Grace. We do sincerely thank the Lord for you and for your prayers for this ministry — that we may see many souls saved for our Savior and many be freed from the shackles of Calvinism, Lordship “salvation” and other false teachings — by understand the reality and believing the Truth of God’s Salvation by Grace. This entry was posted in Assurance, Assurance of salvation, Bible, Calvinism, Christian, Christianity, Eternal Security, Faith, Free Grace, Grace, Hope, Joy, Lordship, Lordship Faith, Lordship Salvation, Once saved always saved, Reformed theology, Salvation, Security of the believer, Thansgiving. Bookmark the permalink. My mind, fingers and eyes failed me — it was Tim Keller not Kelly of whom I spoke. Please forgive the error and confusion.. I will correct it in my comment. Washer’s and Keller’s words condemn them. We have a couple of devastating articles on Washer and his words. Thank you for correcting that, I surely believe we can discern the motives to be bad, but just trying to say, I can’t guess in particular the motives of each man/woman. Why they do these things… and yet by their fruits of course we can know the motives are not pure. I usually don’t think about it more than to ponder that only the Lord knows those hidden things completely. I agree with you of course, there are plenty of motives such as the one you mentioned and the Word mentions many reasons why they do what they do; Cain, Balaam, Korah also comes to my mind. I had someone suggest that Washer had a heart to do right because of his tears, and sure, he may be sincere and sincerely wrong in his motives. But even in that “appearance” of humility and caring, I would not guess his motives to be good, I don’t know though why, I just know for sure His fruits of doctrine are bad. We can know them by their fruits. It was Bruce who placed the Rockwell painting on the article. I thought it was a wonderful idea. He initiated the appropriate graphics on all our articles. And it was I who asked Chay to contact you and give you a word of encouragement. Bruce may have done so also. What a blessing to have Dr. Fred Chay as a Sunday School teacher!! I think it not too presumptuous to judge (discern) Keller’s motives by his words. Jack, I appreciate men of God who are willing to humbly but firmly and boldly speak the truth. 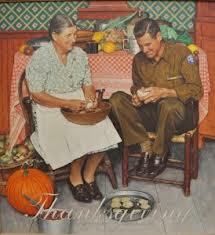 I forgot to share that I am a Rockwell Art Broker, so I had to smile when I saw you use a piece of his artwork. This morning, my son Gifford was talking to the Chays, and they asked, “Is Holly your mom?” He said he thought to himself, “Uh oh”…. evidently Bruce must have shared with him, but I am so thankful to the Lord for His direction of our family’s footsteps. God bless you all, and may the Lord reach many with the truth that is told through your site. John, that is one I use frequently, thank you for sharing, love the confirmation. I do not understand why people listen to these men, vs. going to the One who will clean them up. Like Peter, they don’t want to let the Lord wash them, they will do it. Maybe not the best analogy, but it’s what I think on when I see the pride of these men, and their feigned love and humility. I don’t know their motives, only He does, but I can judge for sure, the fruits of their doctrine as bad. I was thinking on Rahab the harlot in reading Joshua this morning, when she believed, and when her faith was accounted to her as righteousness, yet it was in receiving the spies in peace, (and didn’t perish with them that believed not) yet there she was lying to hide the spies…shouldn’t chuckle, but was thinking on the Perseverance of the Saints and wondering what they’d think about poor Rahab had they been there. I think they’d accuse her of not persevering. Her works was belief in God, those who perished, they did so in unbelief. Sorry for rambling, thank you for sharing that passage in Gal 3, I love that entire book as I do His Word, but that one has a bit of a special place in my heart. I am sorry your comment did not “stick” but thanks for trying again. You are welcome — and we appreciate your comments and prayers. You are so right, God’s Word sanctifies as we are obedient to it and Him. That is His desire for every believer in Christ. I guess my post didn’t stick yesterday, but wanted to say thank you to you all, Jack, Bruce, Tom and all my brethren here. I am so thankful to the Lord that I finally realized that I could not do it on my own. I could not clean up, could not be good enough, truly I needed to come to Him, believing, just as I was. No strength of my own, no feeling even, just a need for help. And He was my Succourer… I totally trust in His work on the cross, not my dead works, nor any ability to finish in the flesh. I thank the Lord for brethren like you too, people do not realize or see how the Good News has been corrupted subtly. They somehow continue to insist you are preaching licentiousness by leaving their man centered additions out of the gospel. They do not trust in the power of God unto salvation evidently when they feel the need to doctor it up and add their gimmicks which of course can be purchased on their site. I was reading a Paul Washer quote yesterday. “If you want to follow Jesus because He’ll fix your marriage, if you want to follow Jesus because He’ll give you a better life, that’s idolatry. Again, I know you can’t help but notice, how they always have plenty of worthwhile thoughts, partial truths, etc., just enough to either inspire guilt so someone will try to work harder, or for someone whose senses aren’t exercised in the strong meat to shout out “Amen”. But somehow, as we know, partial truth, is not enough. Of course He is worthy, but we are not worthy without Him. He is our righteousness, and we will follow Him because He has the Words of eternal life. How about Paul points people to the Word so they might be sanctified? How is it that they forget that God’s Word sanctifies vs. their own? Or did they forget? God bless you all in your efforts to bring those glad tidings of good things. Keep those beautiful feet prepared! Just to say thanks for the freedom in Christ and that we are not bound to sin anymore! Thankful for His Agape love for us! We do not have a deterministic god, we have a God who gives us the free will to choose Him and love Him, so that we could have fellowship and communion with Him. Thankful that there are the remnant who know and see the truth in Gods Word! First of all giving thanks to our Savior Jesus Christ. There is no greater gift than the gift of salvation. And thank God for showing this sinner mercy,love, and hope. I am thankful that I found this site. Thank you Bruce, Jack, Pearl, and all the other people that I miss….(sorry). Welcome, glad to have you visit and comment. We are happy you see clearly the error of LS and Calvinism,…. and see the Truth of God’s Gospel of salvation by Grace alone through Faith alone in Jesus alone. I like that, Matt. A refreshing take. Mike T, I know I would (and have). Like you said, thank God it’s never been dependent on me. An incredible resource for you and for me! I am so thankful that salvation is by grace alone in Christ alone based on His finished work (john 19:30) alone. If I had to do something (works) I would probably mess it up mike t.
Well look there! We were thinking the same thing, John, as well as typing simultaneously (only you were waaaay more thorough). Very cool to put up all those links. Welcome, Barachem, from the beautiful Netherlands! I’m so glad you wrote and I totally echo your thoughts. Well said. Thank you, Bruce, for your comment. There are several names in your list who I didn’t get the opportunity to know, and others I did. Most all played a vital part in where I am today. Apart from Jack and before I met you, Jan was most instrumental in explaining LS and its subtleties to me when I first came aboard January of 2011. Her keen perspective continues to be a hard felt loss on this blog. I am thankful for the love of God and the amazing gift of eternal life through faith in Christ. When I first trusted Christ, many that I knew said that I was just going through a phase and that I would “get over it.” I STILL have not gotten over it! I am still amazed by the salvation I received some 40 years ago! The Lord has been so patient and gracious to me. His blessings are far beyond the ability of our language to express. As Paul said, ‘Thanks be unto God for His unspeakable (indescribable) gift”. 2 Corinthians 9:15. I am thankful for my dear friends Jack and his wife Shirley. With Jack’s poor health always an issue, especially his near blindness, and with Shirley’s faithful support and love for him, I am blessed to have them as examples of steadfastness and commitment to our Savior and His principles of living, regardless of the challenges of life. I am thankful for my dear wife Sue whom I met through Jack’s church many years ago when I was doing youth work there. She is a huge blessing in my life. I am also thankful for our wonderful daughters and their godly husbands and their children. Grandchildren ARE wonderful! I am thankful for the godly men in ministry that the Lord has allowed me to know and learn from over these 40 years. The Lord is so good to us! I am also thankful for ALL the new friends I have met on this blog. You all have been a great source of encouragement and learning for me! I am especially thankful to Jack, Bruce, and my new friend John. May the Lord richly bless all who come here and use this place for His glory always. I’m thankful that our Lord Jesus Christ saved us from eternal damnation and that He is using brethren like you to keep spreading the wonderful, clear and simple gospel of the grace of God [Acts 20:24] for this day and age. I’m thankful that i’m alive, that my needs are provided for and that whatever happens, there is a beautiful future ahead for me and all of us children of god, who believe on Jesus Christ as their Saviour. My country, the Netherlands, does not have such a tradition as thanksgiving, maybe it had in the past, but it doesn’t now. God bless you brethren and thanks for beings such a blessing in Jesus Christ. Thanks Pearl, Jack and John for your kind words. I am grateful to God for our long-time and/or regular contributors and commenters at Expreacherman.com which have made this site a strong voice for the gospel of grace worldwide. Here are some names that come to mind. Please forgive me if I have missed anyone as this list is not exhaustive. Jack, John, Pearl, Jim F., Abe, Jon, Dr. Tom C., Lou M., Faith, Mark, Matt, Jan H. (We miss her! ), Kim, Mike, Glenroy, Levi, David W., Alana, Paul B., Bum L., Tim, Derick, Timothy, Sam, Bill H., Holly G., Kevin, Terry, Bob T., Andy, Richard, John G., Daniel, Jimmy, JR, Matthew, Rebecca, Marlane’a, Marcee, Always on Watch, Eddy (How are you Eddy? ), Daisy, Madeline, Sueliz, Andrea, Ken, Brie, Ron S. . . .
Again, if I missed your name, I’m sorry. Oh bother; I left my Thanksgiving sentiments on the last thread before I discovered this awesome post. How can I begin to add to what you and John have so thoroughly and graciously expressed? I have nothing but a hearty amen! It is great to have visitors from so many countries! I posted this comment in a previous thread — but it is such good news — we should all rejoice in it. Jack, I am thankful for this ministry, for you, Bruce and everyone who visits or comments on this site. I am thankful for God’s loving kindness toward us. I am thankful that He loves us so much that He wants us to have eternal life and that He freely gave His only begotten Son to be our Savior. As much as I love my children, I know that God’s love for them (and me) is infinitely greater. It is amazing to me that organized religion depicts our perfect, righteous, just, merciful, gracious and loving God as a God who would provide an imperfect, incomplete, feckless salvation that we would need to augment. I am thankful that this ministry accurately presents the Good News as good news. I will continue to pray for this ministry. In particular, that any visitor to the site who has never received God’s Grace through faith in Christ would understand and believe the Gospel message. Also, that visitors to this site who are believers would grow in the knowledge of the truth.